Another weekend always means another little (or big) DIY chore here and there. We’re always torn between those tasks we think we can do ourselves and those that it would just be easier and far less time-consuming to bring someone else in to do. I’ve spoken to Pete quite a lot about outsourcing lately and there’s probably more value in me putting my time into the blog rather than all these DIY projects but then I’m so paranoid that work won’t always be completed to the level that we want it and so it’s less stressful if I do it (or we do it together). In the two and a half years we’ve been in the house, we’ve learned new skills and accrued a serious amount of extra tools, tricks and information – I can’t believe that in my first ever bit of painting (the kitchen), I just used one paint for walls, woodwork and the radiator. It didn’t occur to me that it would be better to use a separate paint for the woodwork, such a novice! Now we’re a little more accomplished but I’m definitely more impatient than Pete at preparing and we could definitely do better at making sure we have the right equipment for the job. 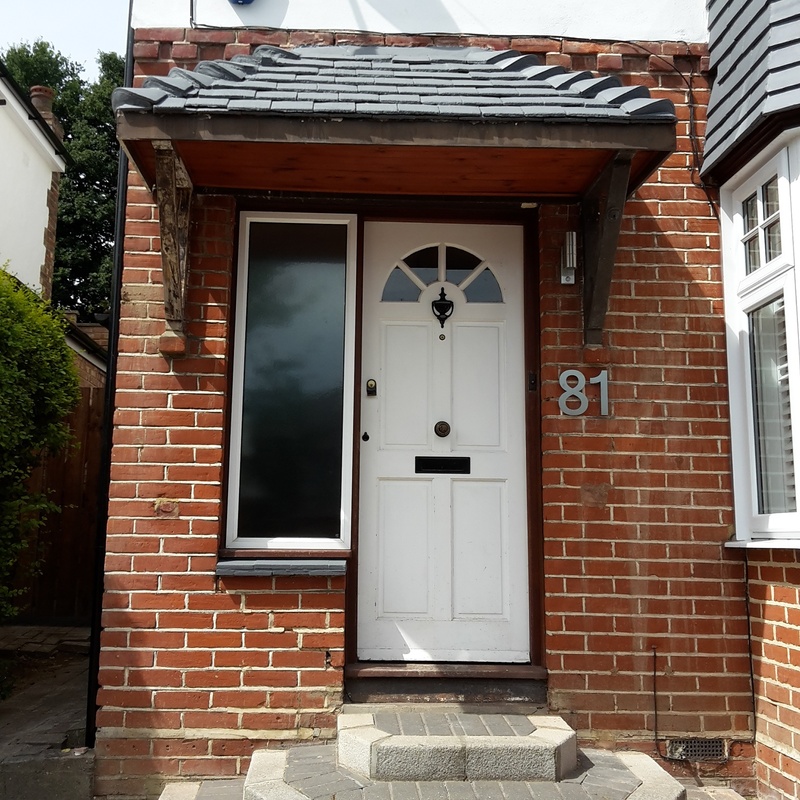 Our current project being tackled is a little makeover of our front door which you can read more about the reasons behind here. Some parts of it, like replacing the glass panel to the side of the door, we’ve needed to call in professionals to do. 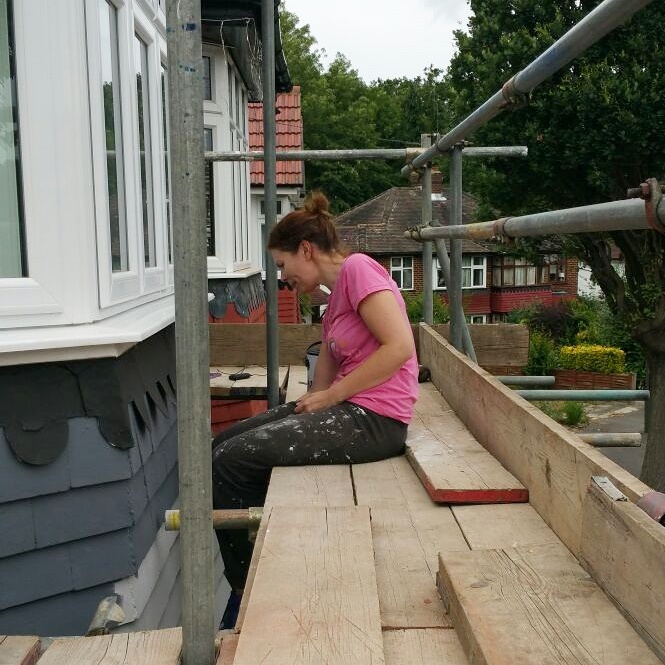 Other parts of it, like stripping and repainting the roof supports and woodwork, we’re tackling ourselves and are making slow but steady progress. Sadly, we don’t have the last two in our repertoire yet which is so annoying because paint stripping and sanding is one of the messier DIY jobs and as we’re taking it in turns to work our way round the wood, we’re both ending up covered in dust. We tend to pick items up from B&Q or Wickes as they’re local to us but Engelbert Strauss is a great online alternative, offering a wide range of workwear clothing and safety wear. It won’t be long until we finish this project and move on to the next one…and there is probably about another 20 years’ worth of work to do on this house so investing in the right clothes for the job will definitely be next on the agenda. I was a complete novice before we bought our current house too. It needed a complete renovation though so over the years I have learnt how to take down a ceiling, hack plaster off walls, dig up a floor, chisel chasers into the walls for the electrics, plastering, rendering, laying decking. It’s amazing how many talents you can pick up along the way. Thankfully after 10 years we are about done now, but the hubby gets bored easily so I’m sure it won’t be long before he finds another project for us to embark on!